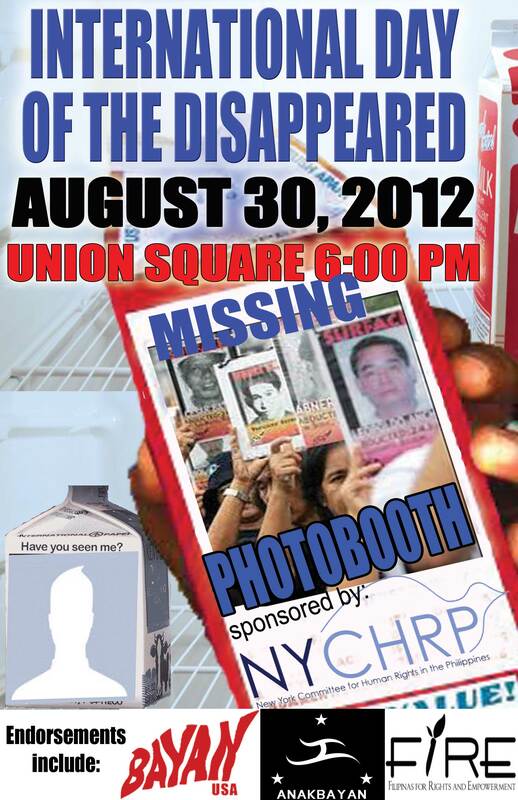 THIS Th, 8/30: International Day of the Disappeared @UNION SQUARE NYC! Take a photo. Take a stand. On August 30, the International Day of the Disappeared, the New York Committee for Human Rights in the Philippines (NYCHRP) will bring attention to the thousands of Filipinos who are victims of enforced disappearances in the Philippines. The International Day of the Disappeared on August 30 is a day created to draw attention to the fate of individuals imprisoned at places and under poor conditions unknown to their relatives and/or legal representatives, or victims of enforced disappearances. Imprisonment under secret or uncertain circumstances is a grave violation of some conceptions of human rights as well as, in the case of an armed conflict, of International Humanitarian Law. Under the current President of the Philippines, Benigno “Noynoy” Aquino III, there have been 11 cases of Enforced Disappearances in the Philippines. Since the Arroyo Regime (2001-2010), 205 are still missing. The families seek justice, the Philippine government must be pressured to SURFACE THE DISAPPEARED and END IMPUNITY NOW!We demand that these victims are surfaced and their perpetrators are brought to justice. This event is endorsed by BAYAN USA, ANAKBAYAN NJ, ANAKBAYAN NY, and Filipinas for Rights and Empowerment. Did you participate? Thank you! Your photo will be HERE. Next Post August 30 photobooth!